Accolade, the technology leader in advanced Network application acceleration network adapters / NICs will exhibit at RSA Conference 2016, the largest information security event in the world. RSA’s mission is to connect people, exchange ideas, and showcase the latest trends available to stay ahead of global cybersecurity threats. 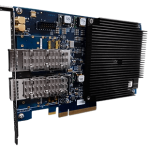 Accolade will be showcasing the market’s first Dual 40GE/8x10GE Flow Processor, the ANIC-80Ku, which enables OEM customers to focus on software innovation that maximizes product differentiation and accelerates time-to-market in network monitoring and security solutions. Dual QSFP+ interfaces support operations as a Dual 40GbE and 8x10GbE Adapter.